WebSite X5 Professional 17 - The best desktop website builder for professional websites and online stores! The best desktop website builder for professional websites and online stores! 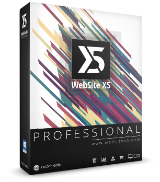 Win one of the 5 licenses for WebSite X5 Professional 17! WebSite X5 Professional 17 offers you the best way to launch and grow your online activities. Impeccably designed websites tailored for every kind of business, advanced features to sell physical products, and management that's all in one place, including your mobile device, with the included WebSite X5 Manager and Feedready apps. In just minutes, create original websites, product landing pages, and professional online stores for you and your clients. Programın satış fiyatı $199.00, fakat yarışmamızın kazananları ücretsiz sahip olacaklar.